From the end of July, 2018 the citizens of 74 countries can enter the Republic of Belarus for 30 days without visa through Minsk National Airport. This rule is effective only if a person comes through Minsk National Airport (a person should exit also through Minsk National Airport). Nowadays from February 2017 until October 2018 more than 155 000 people traveled to Belarus using a visa-free system. What do I need to have to enter Belarus with no visa? You should have a valid passport, money (approximately USD 25 per 1 day of stay), a medical insurance in medical coverage at least €10,000 in Belarus. Insurance can be bought on arrival in the airport. Below you can find a list of countries which can visit Belarus with no visa. How many times can I visit Belarus using visa-free rule? 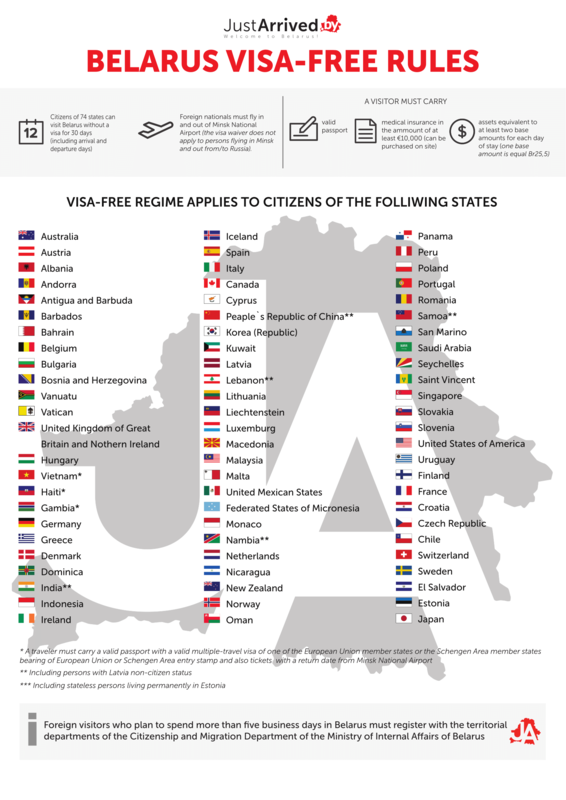 In accordance with the legislation of the Republic of Belarus there is no limit on number of visa-free entries. It means foreign citizens can use this opportunity to visit Belarus as many times as they want. My country is not in the list so can I anyway come to Belarus with no visa? With some countries Belarus has signed special agreements that allow people to travel without having a Belarusian visa for the term that even exceeds 30 days. These are the countries: Azerbaijan, Armenia, Georgia, Kazakhstan, Kyrgyzstan, Moldova, Russia, Tajikistan, Uzbekistan, and Ukraine. For the mentioned below countries Belarus made visa rules more flexible. – Chinese citizens don’t need a visa in case of a transit travel (up to 3 days if you come by direct flights from China and have a valid Schengen visa). 30 days is not enough for me, can I stay longer? As a general rule – NO. You can stay longer and leave later only in case of illness, natural disaster or some other unforeseen circumstances. In this case you will need to receive a new visa in the Migration Office. Rule-breakers might also be deported and fined up to approximately 580 USD. Can I leave Belarus by bus or by train? Unfortunately, NO. The law about 30 days no-visa visit says that you have to enter Belarus through Minsk National Airport and leave through the same airport. You cannot leave through any other checkpoint. Do I need to go for the registration to the Migration Office? YES. The registration is required for all people who stay in Belarus more than 5 days. If you stay in the hotel/hostel they will do the registration for you by themselves. If you stay in an apartment you should ask the owner of the apartment to make the registration for you.